Dr. Scott was affected by chronic neck pain and headaches as a teen. Chiropractic was the only thing that helped, and he knew he was interested in the medical profession. He was about to take the MCATs to become a medical doctor when a school presentation changed his mind. Palmer College of Chiropractic came in to speak to a class during Dr. Scott’s undergraduate years. 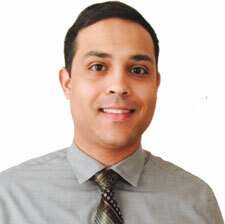 It sparked his interest in chiropractic even more, and he decided to become a chiropractor. First, Dr. Scott attended Florida Atlantic University in Boca Raton to achieve a degree in biology. His next step was applying to the college that had influenced his decision, Palmer College of Chiropractic in Port Orange, FL. Dr. Scott enjoys providing patients with holistic health care, so they don’t have to resort to more drastic options. I love helping people. I think chiropractic is something everyone should look into before choosing medication or surgery. Dr. Scott is a South Florida native. He played soccer and took tae kwon do as a young adult, enjoying an active lifestyle. He is a first-generation chiropractor, which is unusual since many choose to enter the profession due to another family member’s influence. He is proud to be the first in his family to offer patients natural health care. Are you ready to find out what chiropractic has to offer you? Call today!